You and Your Big Dreams: Summer Hooray! Happy Tuesday! Why is it happy? Because it's time for another Papertake Weekly Challenge! The theme this week is Here Comes the Sun! You can make whatever reminds you of summer. Our City's Fair is called Old Fashioned Days. They come every year and we go every year :) Does your hometown have a yearly fair? I used Hero Arts set called Life of The Party Birthday. The images can be used for so much more than birthday! I am entering this card into Gallery Idol 2011. It is a congratulations theme. The banner pieces were colored with broken china, spiced marmalade, and worn lipstick. The cotton candy top was colored with tumbled glass, broken china, and faded jeans. For the ice cream top I used spun sugar, worn lipstick, and barn door. Now I'm sure you are thinking Kelly, three colors for that little piece . . .three?! I know it seems like a lot but it really adds a ton of dimension. For the bottom of the cotton candy I used a marker. The ice cream bottom involved a little change. The stamp image has the strips as a solid with no outline. I wanted to to be consistent with the cotton candy so I stamped in worn lipstick then drew the black lines with my pen and ruler. I stamped the ticket 3 times, cut them out and colored with scattered straw, spiced marmalade, and rusty hinge. The blue strip underneath them is colored with more broken china. I created a standard sized card out of white card stock then stamped the banner three times. I masked one bow each time I stamped. I popped up the banner, the cotton candy and the ice cream with foam adhesive. To add some fun shine I used stardust stickles and glossy accents. 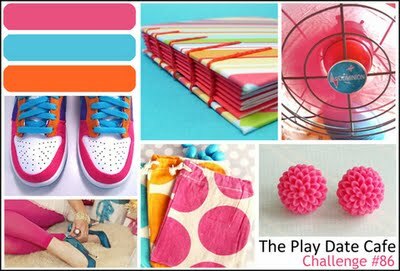 The colors for this card came from the current Playdate Cafe Challenge. These are such fun summer colors!! Thanks for coming to look!! I hope you all get a chance to play along with us Papertake Weekly! 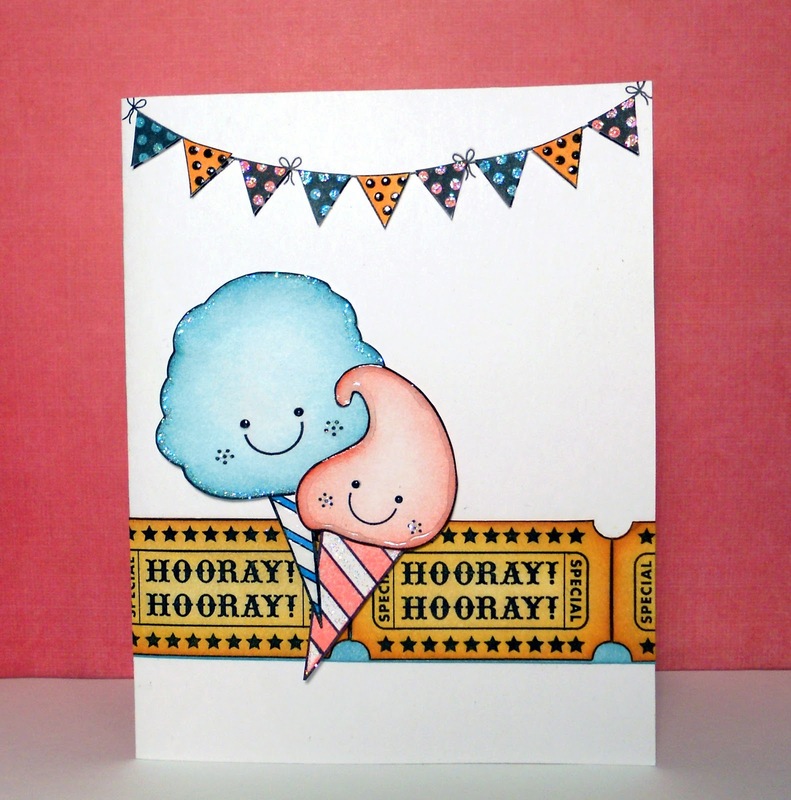 What a super sweet card--love the double cotton candy images:) THANKS so much for playing along and joining in the fun over at the PDCC!!! Oh so sweet! Love the glittery accents, I could just eat that cotton candy it looks so yummy. nice job! You are super talented! I love every card you make. Keep it up! Beautiful post and great photos! ..